With the selection of Argentinian Cardinal Jorge Mario Bergoglio as Pope Francis I, the Catholic Church has recognized the growing significance of Latin American Catholics for the future of the Church. Click photo to download. Caption: Pope Francis. Credit: Tenan/Wikimedia Commobs. For Jews and the state of Israel, fostering relations with that community should also prove critical for the future of Catholic-Jewish relations. “We believe that it is important for the Catholic leadership in Latin America to personally see Israel for themselves, through their own eyes, not only through the eyes of the media,” Betty Ehrenberg, executive director of the World Jewish Congress (WJC), told JNS.org. According to the Pew Research Center, the largest share of the global Catholic population, 39 percent, lives in Latin America. To put that figure in perspective, as of 2010 there were more than 425 million Catholics in Latin America—nearly 115 million more people than the total population of the U.S., and 410 million more than the global Jewish population. In order to foster this relationship, a new program organized by the WJC, the Center for Jewish-Christian Understanding and Cooperation in Israel (CJCUC), as well as the Latin American Jewish Congress, brought young Latin American Catholic leaders on a week-long educational mission in Israel. “Coming from South America, they don’t have that many opportunities to interact with Jews,” Rabbi Eugene Korn, the American director of CJCUC, told JNS.org. According to WJC, the focus of the CJCUC mission is to highlight the improvements of Jewish-Christian relations since the Second Vatican Council in 1965, which changed the church’s teaching on Judaism and denounced anti-Semitism, as well as to introduce young Latin American priests to Israel and the Jewish people. The Latin American Clergy Mission of the Center for Jewish-Christian Understanding & Cooperation. Credit: CJCUC. “That’s why it is absolutely critical for us to teach them about current Catholic doctrine on Judaism and to introduce them to Israel,” he added. According to Korn, the Latino priests “had a magnificent time” when visiting Israel with CJCUC. Korn said that one of the most enlightening moments of the trip for the Latin American priests was their visit to Domus Galilaeae International Center, located on the Christian holy site Mount of Beatitudes near Capernaum. The center was inaugurated by Pope John Paul II as a place for inter-religious dialogue and a location where Christians can have direct contact with the living tradition of Israel and explore the Hebrew roots of their faith, according to its website. At the center, the priests had a chance to hear from Father Francesco Voltaggio, rector of the Galilee Seminary, who explained to them the Jewish roots of Christianity. Voltaggio told the priests that they shouldn’t think of Jesus as being a Christian. In fact, he emphasized to them that Jesus was born, lived, and died as a Jew. “Initially they were a bit surprised, but they didn’t resist the idea. They took it as authoritative. They would have never understood that if they hadn’t visited Israel and spoken with Catholic leaders there,” Korn said. JNS.org asked Voltaggio about his encounter with Latin American priests and the importance of further dialogue between Latin American Catholics and Jews. “I noticed a great thirst for knowledge of Jewish traditions, Jewish roots and context of Christian faith, a sincere love towards the Holy Land, a relationship of sincere friendship…I think it is essential for Catholics from Latin America to know about Judaism and Israel, not only at the intellectual level, but in an experiential way,” Voltaggio said. Click photo to download. 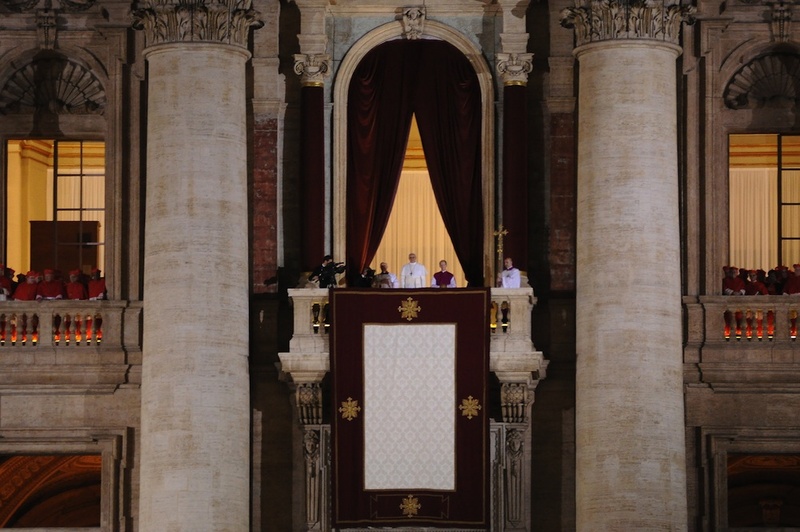 Caption: Pope Francis appears to the public for the first time as pope at the balcony of St. Peter's Basilica, March 13, 2013. Credit: Tenan/Wikimedia Commons. The papal selection of Cardinal Bergoglio, who is well-respected by Jewish leaders for his close relationship with Argentina’s 200,000 Jews and for his compassionate response to the 1994 terror attack on Buenos Aires’ Jewish community center that killed 85 people, provides hope that Catholic-Jewish relations will continue to grow in a positive direction under his leadership. “As priest, bishop and cardinal, Bergoglio has shown his love towards the Jewish people and especially towards the Jewish community in Argentina. We are sure that he will continue to do so at the world level, strengthening and improving bonds of love and dialogue. I think he will do so in a creative way, which will surprise us... The fact that he is from Latin America will lead Latin-American Christians to become ever more sensitive towards the Jewish world,” Voltaggio told JNS.org. Dr. Philip Cunningham, professor of theology and director of the Institute for Jewish-Catholic Relations at St. Joseph’s University, agreed with Father Voltaggio’s feelings on Bergoglio. “Based on what I know, my expectations are that he will continue in the tradition of Pope John Paul II and Pope Benedict XVI in building and nurturing Catholic-Jewish relations,” Cunningham told JNS.org. “His emphasis on poverty and social justice is a point we have in common. Concern for the poor and is really big in Rabbinic Judaism. There are a lot of areas where we can work together on this issue,” he said. On his first day on the job, Pope Francis showed his commitment to furthering Catholic-Jewish dialogue by writing to the Chief Rabbi of the Rome Jewish Community, Rabbi Riccardo Di Segni. “I strongly hope to be able to contribute to the progress that the relations between Jews and Catholics have known since the Second Vatican Council,” the Pope wrote. “Already we are seeing Pope Francis’s values of simplicity, humility, graciousness and openness. This is a valuable thing interfaith dialogue,” Cunningham told JNS.org. While the selection of Bergoglio will be crucial for continued positive Catholic-Jewish relations, real long-term change, especially in significant regions such as Latin America, will need to come from leaders on the ground, according to Voltaggio. “Even though the dialogue is very positive and lively at the level of individual with bishops, more needs to be done at the grassroots level. On the Catholic side, we cannot know our identity deeply, without a profound knowledge of our Jewish roots,” he JNS.org. ownload this story in Microsoft Word format here. Posted on March 18, 2013 by Sean Savage/JNS.org and filed under News, Features, World, Christian.